We are several weeks removed from the beginning of Lent on Ash Wednesday, March 6, but I have been thinking back on our Ash Wednesday experience from time to time. Ash Wednesday at St. Peter’s has been exceptional for many years. Some years ago there were so many people wanting to receive ashes on that day that we had to have police officers stationed outside the church and police barriers along the sidewalk to make sure that the lines were kept in order and pedestrians allowed to follow along unhindered. It certainly made for a great witness to passersby that something very important was happening at the church. Those days are somewhat gone nowadays, but we still have a semblance of this witness, especially during the midday hours on Ash Wednesday. 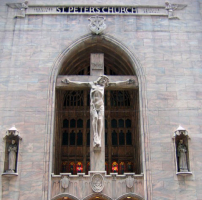 The lobby of St. Peter’s is filled with all kinds of people here for a variety of reasons. Some are wanting to celebrate the Sacrament of Reconciliation (Confession or Penance); others are waiting to get into church to participate in one of the twelve Masses celebrated on Ash Wednesday (and many of these Masses were packed with people who often sacrificed some or all of their lunch hour to attend); others were here to have their forehead ashed as an outward sign of their repentance and intention to repent, and still others wanted to visit the Book and Gift Shop to purchase some Lenten materials for use throughout the penitential season. It is a humbling experience to be a minister of ashes and to pronounce the solemn words “Remember you are dust and unto dust you shall return” or “Repent and believe in the Gospel.” It is edifying to recognize that all are welcome: the rich and the poor, the elderly and the young, the tall and the short, male and female, the professional and the unemployed, the student and the retired. On this day everyone is equal, everyone is acknowledged as sinner, everyone is in need of conversion. And at least for this one day we are willing to keep the ashes on our foreheads as long as possible, thereby allowing others to see us for who we are: Christians in need of constant conversion and people on the road to further identification with Jesus Our Lord. In this regard, it was truly unfortunate that a young student in a Utah school district was forced to wash his ashes off by a teacher who said he could not give witness in this way. Thankfully the district apologized and the teacher reprimanded. The witness of our ashes for that one day hearkens back in one sense to the penitential practice of the early Church when public sinners confessed their sins to the bishop on Ash Wednesday and then did public penance for an assigned number of weeks, or even years in some instances. Often these public sinners had to stand outside the church on Sundays, clad in sackcloth and ashes, to beg forgiveness of the Christian community and to ask for prayers from those going to Mass. They were not permitted to be part of the worshipping community and to receive Eucharist during their time of penance. It was only after they had completed their penance (and hopefully resolved to not sin in like manner again) that they were given absolution during Holy Week and received back into the community on Holy Thursday. We have lost some of the external witness of those first centuries in our more privatized celebration of confession now, but one way we can retrieve it is to participate in the Communal Form of Confession which we celebrate twice during Lent and several other times during the year. In that form we all are there as sinners, and we confess publically in the midst of the community. It does bring out that our sinfulness is not just between God and myself, but my sinfulness also harms the community by my negative example. At any rate, if you have not yet made your Lenten confession, don’t wait too much longer to do so. Another aspect that you might consider is trying to speak more openly about your Catholic faith when appropriate rather than hesitating out of fear or of possibly being mocked. Always remember St. Paul’s admonition that we are called to be “fools for Christ.” May you continue to have a fruitful Lenten observance. The demands of daily life can be so great that we sometimes find it easy to rationalize bad behavior. But then something happens that makes us aware of our failures and limitations. We acknowledge our behaviors and move forward a changed person. The First Reading today tells the story of Moses’ encounter with God in the burning bush. Distracted from herding sheep, Moses checks out a curious sight—a bush that burns without burning up. In that moment, God directs him to step out of his mundane world into a holy space. Moses responds in terror, afraid to see God’s face. He is given a mission and again he cowers, saying something to the effect of “Who am I to do this thing?” and “I don’t even know who you are!” He owns his inadequacies, but he goes forward in trust of God’s care. Sometimes we change our ways out of fear of punishment. In the Second Reading, Paul alludes to a later part of the Exodus story to remind the Corinthian community not to follow the Israelites’ example. They had experienced God’s presence in the parting of the sea, the manna, and the water from the rock, and still they grumbled against God and committed evil deeds, resulting in punishment by poisonous serpents. People sometimes try to make sense of horrific tragedies by saying that it is God’s punishment for wrongdoing. In today’s Gospel, Jesus says that this is not necessarily the case, but he uses the image of the slaughter and defilement of innocent Galileans to emphasize the necessity of repentance. In the First Reading, God introduces himself to Moses as “the God of your fathers.” Dei Verbum explains that God had chosen this people through whom salvation would come to the world. “In his great love God intended the salvation of the entire human race. In preparation for this, in a special undertaking, he chose for himself a people to whom he would entrust his promises” (#14). In the Gospel, the gardener promises to take steps to nurture the tree that has not borne fruit. The gardener is being proactive just as Christians need to be. Pope Francis states in Evangelii gaudium: “The Church which ‘goes forth’ is a community of missionary disciples who take the first step, who are involved and supportive, who bear fruit and rejoice. An evangelizing community knows that the Lord has taken the initiative, he has loved us first, and therefore we can move forward, boldly take the initiative, go out to others, seek those who have fallen away, stand at the crossroads, and welcome the outcast. Such a community has an endless desire to show mercy, the fruit of its own experience of the power of the Father’s infinite mercy” (#24). The gardener in the Gospel plans to cultivate the ground and fertilize it so that it will bear fruit. Ad gentes divinitas explains that this happens with the Word of God. “The seed which is the word of God grows out of good soil watered by the divine dew; it absorbs moisture, transforms it, and makes it part of itself, so that eventually it bears much fruit” (#22). For Your Reflection: During this Lent, how can you reflect the mercy and kindness of God? What would it mean to you to take to heart Paul’s admonition not to grumble? How has someone nurtured your faith? to your word.” Then the angel departed from her. The feast is observed on March 25, which is nine months before the Christmas celebration of the birth of Jesus. The correlation between the conception of Christ and his death falling on the same day follows a doctrinal belief of the early Church, which proposed that many of the major events in the Bible coincided with the Spring Equinox. Events such as the creation of the Earth, the creation of Adam, and the crossing of the Red Sea were purported to have occurred on this date. The origin of this feast can be traced back to the early fifth century. It began in the Eastern Church during the time of the Council of Ephesus, in 431 A.D., and became an observance in the Western Church around 496 A.D. From its inception, there were major differences in the central theme of the feast. The Eastern Church centered the feast on the conception of Christ and His incarnation as the Son of God. The focus of the celebration was God’s power as manifested through the Holy Spirit to birth the humanity of the Christ, a being free from the taint of sin. Christ, in turn, would begin a new generation of the children of God, born of the Spirit through the redemption of His sacrifice. For the Western Church, the Annunciation is a feast honoring the Virgin Mary as the mother of God. The emphasis of the celebration is placed on her acceptance of this honor as the fulfillment of the prophecy written in Isaiah 7:14. It is from this feast that the “Hail Mary,” the recitation of the rosary, and the Magnificat of Vespers have become a steadfast part of Catholic tradition. For Christians everywhere, the Annunciation can be a reminder of the ongoing work of the Holy Spirit in the lives of believers as we are transformed into a people filled and guided by spirit. Here at St. Peter’s we will celebrate this great feast with a Solemn Mass at 11:40 (there will be no 12:15 Mass this day due to the length of the Feast day Mass) and with Solemn Vespers that afternoon at 5:40 P.M. in church. We hope you will be able to join us for one or the other or for both on Monday. On this coming Tuesday, March 26, 2019, the Little Sisters of the Poor will be visiting our parish as they have done for many years during the Lenten Season. They will give a short explanation of their ministry during the weekday Masses and then accept your donations afterwards in the lobby. Here in Chicago this is one of over 180 Homes operated by the Little Sisters in 31 countries throughout the world. Your support will enable them to continue their mission of caring for the elderly poor in a spirit of joy and dignity. Any assistance you are able to give will be deeply appreciated. Blessings! To learn more about their apostolate, please go to www.Littlesistersofthepoorchicago.org. We at St. Peter’s are well aware that so much of what we do ministerially can only happen because of the wonderful volunteers we have who give of their time, talent and effort in a variety of ways. In particular I want to thank you all for all you did on Ash Wednesday, for the Meal for the Poor on Wednesday, March 13, and for serving as Communion ministers, readers, acolytes, thurifers, and ushers at both our weekend and weekday services. Even though we try to thank you individually at specific times, we don’t recognize you often enough in a communal fashion. Know that we appreciate your willingness to be part of St. Peter’s; you are always remembered in our prayers and Masses. God bless you all! After waiting more than an hour and a half for her date, Sarah decided she had been stood up. Exasperated, she changed from her dinner dress into pajamas and slippers, fixed some popcorn and hot chocolate, and resigned herself to an evening of TV.